Max Wilbert and other members of Deep Green Resistance Seattle participated in a May "ShellNO" protest against Shell's arctic drilling rig. 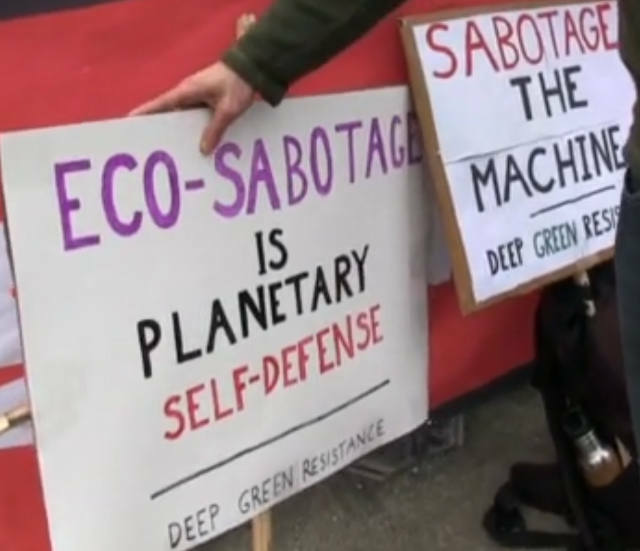 Their display of signs reading "Sabotage the Machine" and "Eco-Sabotage is Planetary Self-Defense" attracted a lot of attention. Elliot Stoller conducted a short video interview in which Wilbert explains his concern about ineffective tactics and strategies in the face of dramatic threats to biodiversity, climate, and social justice. Wilbert discusses DGR's radical evaluation of systems of power and what might actually work to alter their destructive course: targeting critical communication, electrical, and oil infrastructures, and addresses some common questions about what that means for the safety of activists who undertake such work, and what sort of life humans can live without the comforts and elegancies of industrial civilization.